Fairways’ princely mansion stands next to Highgate Golf Course just off The Bishops Avenue, London. Its idyllic position near Hampstead Heath has all the advantages of a rural surrounding without sacrificing any of the facilities of a city. Fairways’ premier address and discreet setting exude an aura that is typical to the houses built in and about this part of the city, as if, anyone approaching the place is already prepared to meet something special. And, one is not disappointed, for Fairways’ stretches the limits of exuberance, but in a refined way. The credit for this goes to celebrity businesswoman and designer Celia Sawyer. 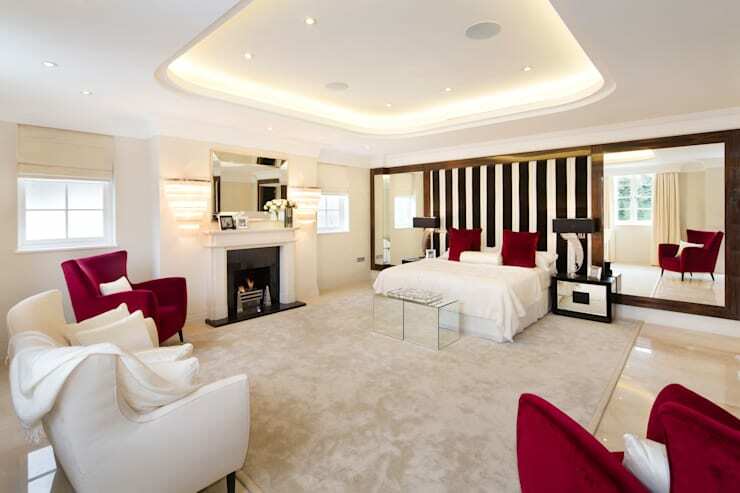 When it comes to planning for the luxurious interiors, she is well known for creating show stoppers. Herself a great believer in the importance of family life, she excels in designing spaces that are dedicated to a well knit family. So it hardly comes as a surprise, that the management of Fairways’ sought her assistance in giving the home an opulent makeover. 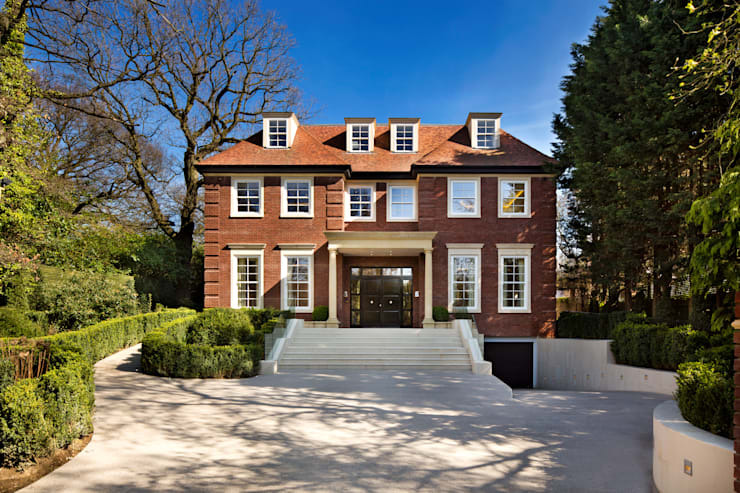 The eight bedroom family house boasts of an internal area of slightly less than 1600 sq metres. The house is spread over four levels. It is guarded by fully automated gated access control, alarm system and CCTV monitoring. One can approach the house through a mineral resin coated driveway. The lower ground floor of the house contains a gym, media room, wine cellar, two self contained staff accommodation and garage. First and second floors are allocated for bedrooms and guest suite. A lounge precedes the reception area. Guests can step into the lounge through an impressive timber door. The grand staircase, covered in premium quality marble, can be used to reach the upper floors of the building. The double volume reception area is located at the ground floor level. An art deco fireplace and a panoramic gas controlled fire keep the 156 sq metres of the reception area warm. Subdued colour tones like beige and very pale grey are punctuated by the dark brown accent wall. Floor to ceiling French windows soak the place in generous amounts of light from the outside and provides excellent views of the rear garden. A grand piano occupies one corner of the living room. With the exception of a prominent mirror, the décor is elegant without being ostentatious. The study shares the ground floor with lounge, reception, kitchen and dining area. The 25 sq metres’ space is fitted with modish furniture, ledges and storage units. It is made to serve a dual purpose of a home office. 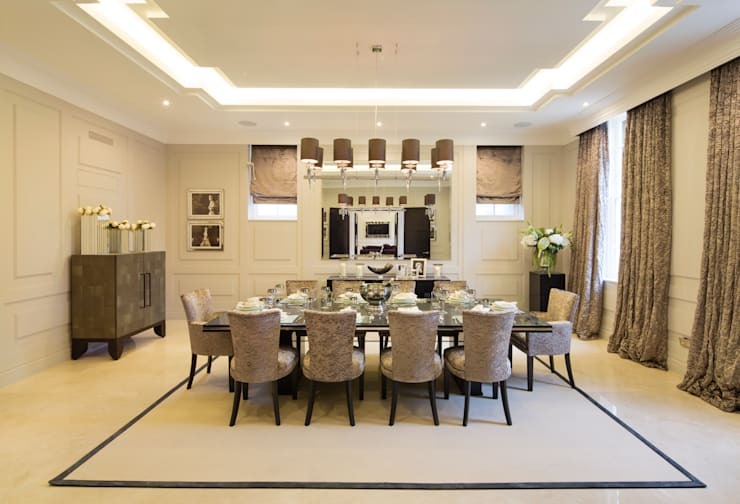 The dining room occupies a relatively modest 41 sq metres area. With a few alterations, the area follows the set colour scheme. Dining chairs and curtains both use a beaver brown shade. Pendant light shades are found to be in matching tone. Ambient lighting is also used to penetrate any residual darkness in the room. Fully self contained master bedroom could be found on the first floor of the building. Apart from the occasional use of rosy plum cushions and upholstery, the 47 sq metres area is literally drowned into a sea of creamy white tone. The room is also fitted with automated blinds, concealed TV unit and integrated audio system. The master bedroom is supplied with fully separate his and hers bathrooms. 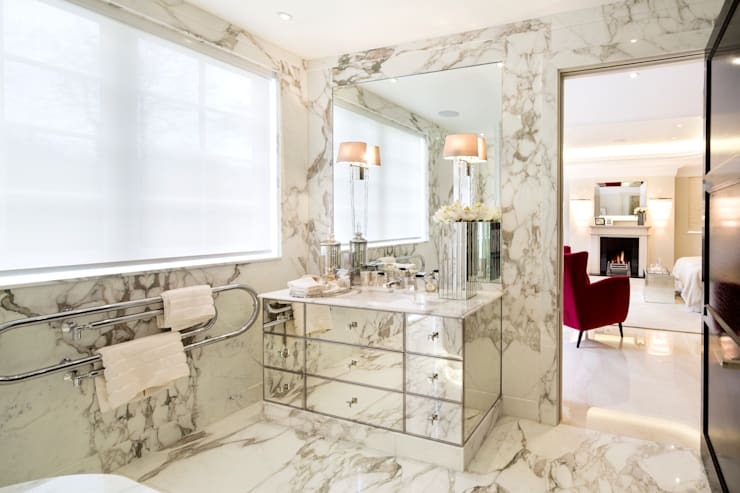 Marble flooring and wall are completed with vanity unites in mirrored finish. Presence of whirlpool bath, waterproof TV and integrated audio system make it extra special. 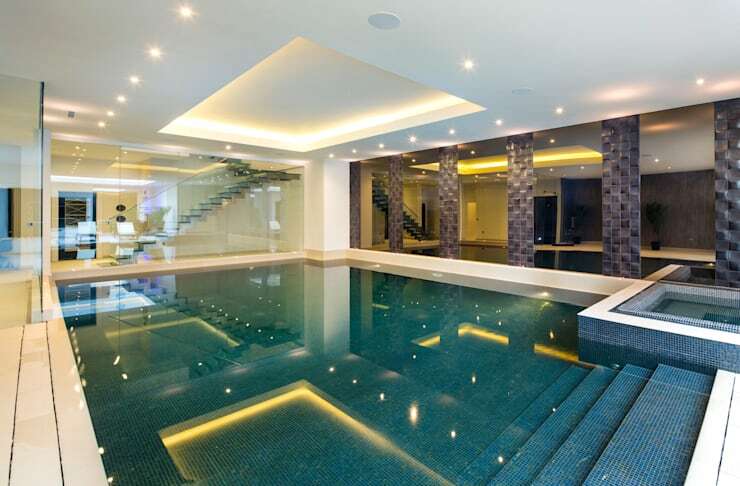 The indoor swimming pool and spa are two of the most prominent features of lower ground floor. Glitzy mosaic tiles cover the base of the 11m x 6.5m x 1.8 m swimming pool. It comes fitted with underwater speakers. Besides, it is flanked by a fully functional bar, separate change rooms, bespoke steam room and sauna. The other major attraction of the lower ground floor level is the fully carpeted velvet covered home cinema room. 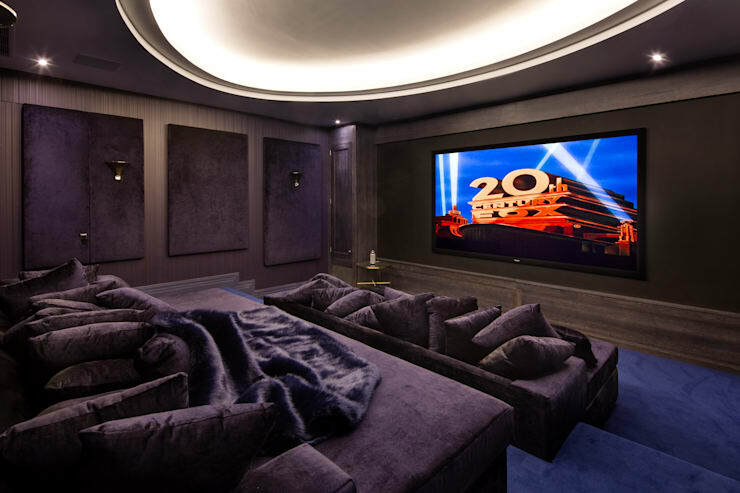 Together with the entertainment system, this room is just like going to the movies, except here, it is possible to screen a show in the comfort of your pyjamas. 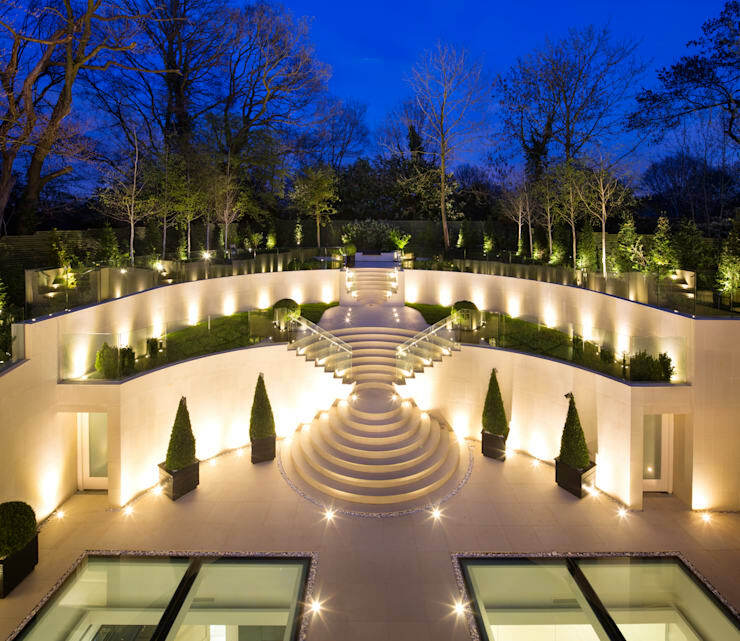 The beautiful tiered and landscaped rear garden provides additional space for entertaining the guests. But, perhaps, this part of the garden is best suited for holding a silent conversation with nature under the starry sky. Do not forget to check some of our other luxury homes by visiting here.